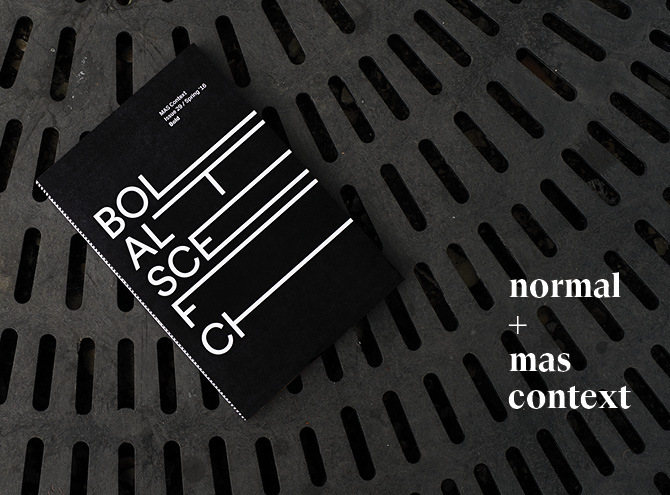 We are happy to announce that our upcoming Bold issue will be designed by Normal. This is the third installment of our ongoing collaboration with individual graphic design studios to shape each one of our issues. After collaborating with Leo Burnett’s Department of Design for our Debate issue, and JNL graphic Design for our Hidden issue, we are now working with Normal for our upcoming Bold issue. Normal, led by Renata Graw, builds from her previous experience at Plural, an award-winning studio she ran for eight years with Jeremiah Chiu. Our relationship with Renata and Plural goes back five years as their work was featured in our first MAS Context Analog event (along with designing the poster for the event), and they designed seven of our previous issues (13-20). Four of those issues were selected by the Society of Typographic Arts to be included in the Chicago Design Archive. Our Bold issue will focus on the work featured in the “Bold: Alternatives Scenarios for Chicago” exhibition included in the inaugural Chicago Architecture Biennial curated by Iker Gil. Normal was in charge of the identity of the exhibition so this is an extension of that work and a chance to continue the test the identity in a different medium. Along with Renata, Alexa Viscius, Rafael Barontini, and Ansgar Klemm were part of the team working on the issue. We are excited to collaborate once again with Renata and her team at Normal as we share ideas that use Chicago as a place of exploration.